Marof is the youngest Panvita branded product and represents the wine. Wine cellar Marof manages 40 hectares of vineyards located in different locations in Goričko. Marof wine growing philosophy is that we do not grow grapes in our vineyards, but wine, because we believe that you can not improve in the wine cellar what you grow in your vineyard. Because of this philosophy, we do not use modern wine cosmetics, additives and techniques, for they rob the wine of its personality given to it by the local climate, soil and tradition. 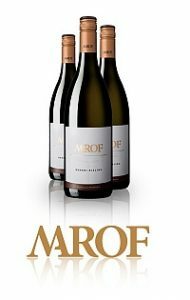 Marof wine is produced under the baton of a young professional and ambitious enologist Uroš Valcla. The wine is precise, of clean flavours, moderate alcohol levels, but above all it is elegant and harmonious. We are proud that we have received numerous awards at major international competitions for our wine. You can read more about Marof wine at: www.marof.eu.